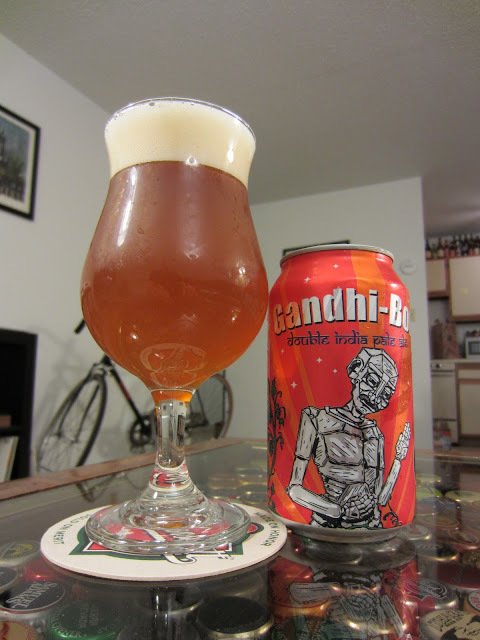 Gandhi-Bot, the canned Double IPA from New England Brewing Company, pours a very hazy orange body with minor tawny notes. The head is smallish for a beer poured into a tulip glass, but the foam is a frothy yellowed off-white that sports excellent retention. The foam leaves a solid ring of lacing at the top of the glass and bits of foam on the glass walls. The beer has a very tight hop nose with a viscous oily pine resin quality. Minor earthy notes mellow the pronounced hops in combination with a minor alcoholic, but not boozy, sweetness. The body of the beer provides a velvety mouthfeel. The beer remains crisp despite the substantial hopping that lends a slick and oily character. This beer is absolutely huge with a dominating pine at its center. Resin is key to the hop component, but a minor woodiness plays off the earthy malt tones that underpin the beer. The grainy malts of the beer are crushed by the hop profile, but the cracked grains lend texture and a sturdy malt base. The finish is warming and the beer leaves your mouth with a viscous coated feeling.